ARP Odyssey synthesizer ad from the back inside cover of Contemporary Keyboard magazine November / December 1975. Looking back over my posts, I've noticed that with the exception of a few posts, I've been neglecting ARP. To help rectify this situation, I've gone back to my earliest magazines to see what I could dig up - and the first result is this ARP Odyssey ad. Free stuff - not only did you get a free anvil case, but it was customized with your name hand-lettered on the side. Name dropping - this ad didn't just name-drop famous Odyssey users, but Odyssey users that lugged their gear around in Anvil road cases. 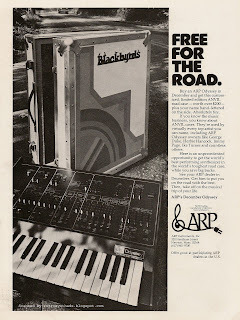 And apparently, based on the name on the road case in the photo, The BlackByrds were one of them. More ARP posts to come in the weeks ahead. Nice to see more ARP stuff going up.